DES MOINES, IA—Popular culture images of lesbian, gay, bisexual, and transgender (LGBT) people suggest that most LGBT people live in cities or on the coasts. Yet an estimated 2.9 – 3.8 million LGBT people call rural America home. Today, the Movement Advancement Project (MAP) released a new report, Where We Call Home: LGBT People in Rural America, which examines the structural differences in rural life and their unique impact on LGBT people in rural areas, who are both more vulnerable to discrimination and less able to respond to its harmful effects. 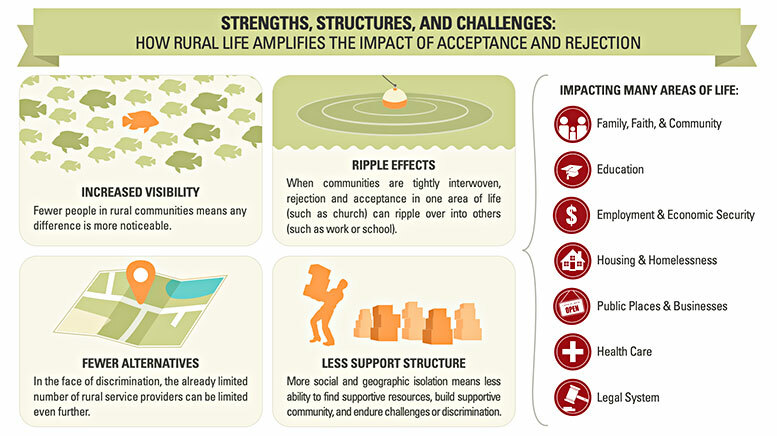 Among other challenges, rural LGBT people are less likely to have explicit nondiscrimination protections, are more likely to live in areas with religious exemption laws that may allow service providers to discriminate, and have fewer alternatives when facing discrimination, as detailed in the new report released today. Where We Call Home: LGBT People in Rural America is released in partnership with the Equality Federation, the National Black Justice Coalition, and the National Center for Lesbian Rights. When LGBT people (and particularly LGBT people of color) in rural areas do face discrimination, they may have no or fewer alternatives to find a restaurant, doctor, job, home, faith community, and more. Amplifying this problem, more service providers in rural areas are religiously affiliated and are covered under religious exemption laws that may allow them to discriminate, even when providing public services. About MAP: MAP’s mission is to provide independent and rigorous research, insight, and communications that help speed equality and opportunity for all. MAP works to ensure that all people have a fair chance to pursue health and happiness, earn a living, take care of the ones they love, be safe in their communities, and participate in civic life. About NCLR: The National Center for Lesbian Rights (NCLR) was the first national LGBTQ legal organization founded by women and brings a fierce, longstanding commitment to racial and economic justice and our community’s most vulnerable. Since 1977, NCLR has been at the forefront of advancing the civil and human rights of our full LGBTQ community and their families through impact litigation, public policy, and public education. Decades ago, NCLR led the way by establishing the first LGBTQ Immigration Project, Transgender Rights Project, Youth Project, Elder Law Project, and began working to end conversion therapy through what is now the Born Perfect campaign. NCLR also hosts regular Rural Pride convenings around the country, which provides a forum to focus on the unique needs of the rural LGBTQ community. About NBJC: The National Black Justice Coalition (NBJC) NBJC is a civil rights organization dedicated to the empowerment of Black lesbian, gay, bisexual, transgender, queer and same-gender loving (LGBTQ/SGL) people, including people living with HIV/AIDS. NBJC’s mission is to end racism, homophobia, and LGBTQ/SGL bias and stigma. As America’s leading national Black LGBTQ/SGL civil rights organization focused on federal public policy, NBJC has accepted the charge to lead Black families in strengthening the bonds and bridging the gaps between the movements for racial justice and LGBTQ/SGL equality. About the Equality Federation: Equality Federation is the movement builder and strategic partner to state-based organizations advocating for LGBTQ people. From Equality Florida to Freedom Oklahoma to Basic Rights Oregon, we amplify the power of the state-based LGBTQ movement. Be the first to comment on "New Report Points Unique Challenges, Rewards For 3 Million+ Rural LGBT People"